The Dutchess Rail Trail Park is a shared use path along an abandoned railroad right-of-way in central Dutchess County. The facility spans approximately 13 miles and runs south to north in a northwesterly direction. 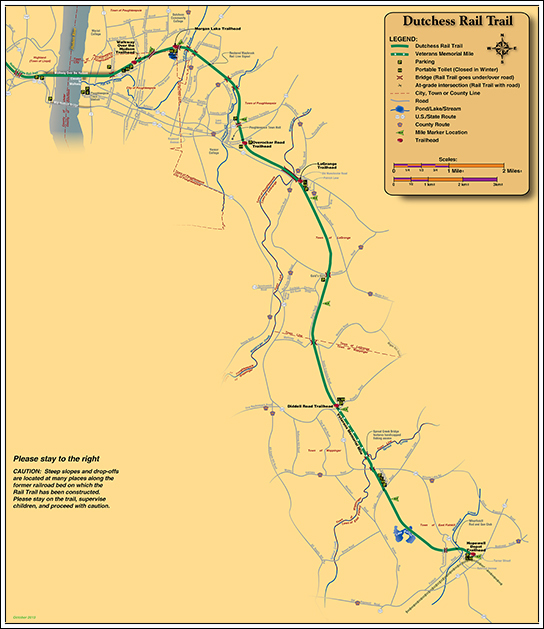 The project originates at Hopewell Junction in the vicinity of Route 82 in the Town of East Fishkill, traverses the Towns of Wappinger, LaGrange, and Poughkeepsie, and links directly to the Walkway Over the Hudson in the City of Poughkeepsie. Trail heads in each of the municipalities provide easy access to the trail with convenient parking. Refer to our directions page for parking locations at the trail heads.